Or as the New Nixon slugs it: In Hoc Signo Vinces. Not. The "IHS" monogram symbolizing the name of Jesus, a central component of the seal of the Society of Jesus, was draped by Georgetown at the request of the White House when President Obama spoke recently at the Jesuit university. That "something" was an ancient monogram -- the letters IHS -- that symbolizes the name of Jesus. It was missing from a wooden archway above the dais in Gaston Hall where the president delivered his 45-minute speech. The gold-lettered monogram appeared near a painting of three female figures -- symbolizing morality, faith and patriotism -- and decorative edging along the wall that spelled out the Jesuit motto "Ad majorem Dei gloriam"—"To the greater glory of God." Georgetown was founded by the Jesuits. Some of them may have been turning in their graves in the cemetery across campus at the sight of the missing monogram which looked like a blacked-out space above a blue backdrop and a row of American flags flanking the nation's chief executive. Was Georgetown selling short its Catholic heritage, we wondered. Julie Bataille from the university's press office e-mailed me that the White House had asked that all university signage and symbols behind the stage in Gaston Hall be covered. The monogram is clearly visible in this photo taken at a panel on US-Russian relations held in Gaston Hall in December 2007. Here's a blowup from another photo of the hall. Note the monogram is draped in this photo of Obama being greeted to the stage. Remember the episode in which John Ashcroft supposedly covered up the bare-breasted statue at the Department of Justice? This White House merely asks that all religious symbols be hidden before the president arrives to speak at a Catholic university. If the White House did ask Georgetown to cover up all symbolism in order to create a more unified visual appearance, Georgetown very clearly failed miserably in carrying out their request. While no Georgetown imagery was present on the podium of the blue curtain backdrop, the Jesuit motto "For the Greater Glory of God and the Salvation of Humankind" was left intact and the gorgeous paintings epitomizing Georgetown's ideals remained unveiled. Mysteriously, the "IHS" was the only symbol above the curtain that was intentionally hidden, at least as far as anyone has made out thus far. Is it not of enormous import that Georgetown is the first Catholic university Obama has spoken at since taking the office of President? Should this not be made clear? Why did the White House deem it appropriate to hide just these three letters? More importantly, why does Georgetown time and time again fail to advertise and promote its Catholic-Jesuit identity in situations like this? 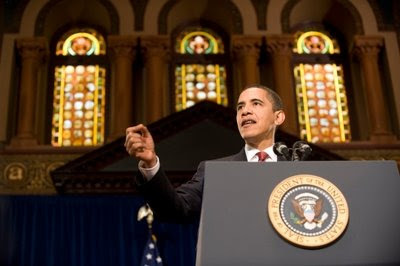 I mean, if Georgetown told the White House that it refused to cover up the IHS and religious imagery, would Obama's staff have cancelled the whole affair? I think not.